Hi Everyone and Happy Monday! I happen to be on a small vacation and hoping this auto posted for me as it was set up to.... let's hope!! Today we have another fun challenge going on at My Craft Spot. Even though it is not my DT week, I just had to play along! The challenge this week we are to create a project and include flowers.... we hope you join in!! For my card base and base layer I have used Spellbinders Decorative Labels Eight die. I embossed the base layer with a flower folder from sizzix and then distressed the edges using Tim Holtz Victorian Velvet. The lacy oval is Spellbinders Floral oval and layered on that is a Spellbinders Classic oval which is embossed with the divine swirls folder. 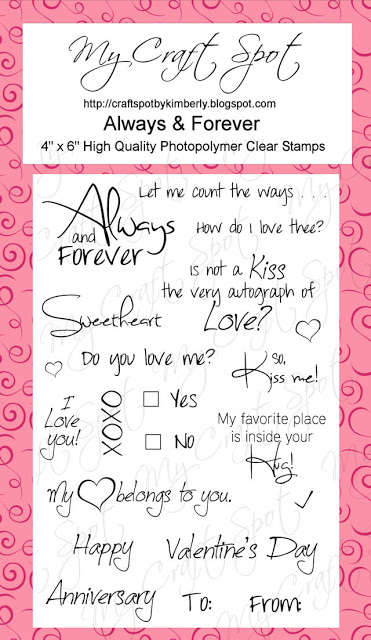 The beautiful sentiment is My Craft Spot Butterfly Kisses stamp set. I added an adorable bumble bee that is cut at 2" from the Paisley cartridge along with the layers. The cute face is stamped with the Peachy Keen Princess face set then added rosy cheeks, freckles and a bow using blueberry Trendy Twine. The corner accent piece is cut at 3 3/4 and the flowers at 2 3/4 from the Art Philosophy cartridge. I finished my card by adding a double bow and some fun rhinestone gems that I picked up at Michael's. Thanks so much for stopping and we hope to see you come join in the challenge at My Craft Spot!! Be sure to go check out what the DT has created for you-they are all amazing! Happy Friday Everyone! I am keeping my fingers crossed that this posted as it was scheduled today as I am off on a small vacation for a few days.....My hubby and I are going with 3 other couples snowmobiling up north. It should be a lot of fun since we got a good amount of snow last week. I will be catching up with all of you next week when I return:) Have a great weekend! 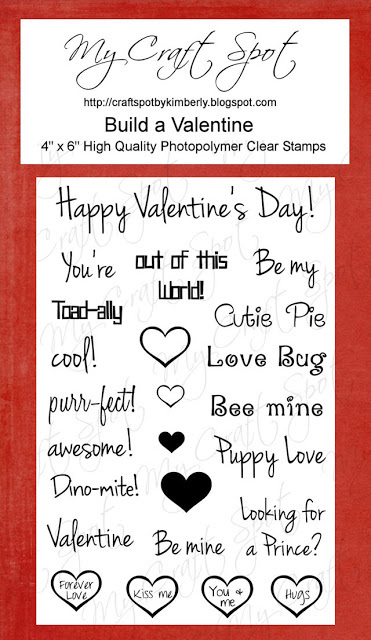 We have another FUN Friday challenge going on over at Little Scrap Pieces and the challenge this week is: Be My Valentine! I made some fun treat favors for the gals at work. I cut paper 2 1/2 x 6, then scored on all sides 1/2", cut in the ends and then folded and taped together. I cut strips of pattern paper 1 x 3 to wrap the nuggets. The paper is from Bo Bunny. I stamped the adorable bear using the Peachy Keen Jan stamp kit. I used copics for coloring them in and then added rosy cheeks, freckles along with adding glossy accents to the eyes. I used My Craft Spot's traditional twine baby blue for the bow. 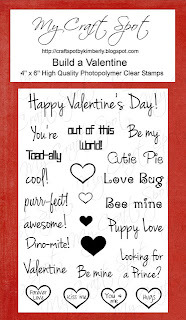 The tag is a My Craft Spot's Tiny Doily Metal Die along with the sentiments from the Build a Valentine stamp set. Hello Everyone! I have made a fun card to share with you using My Craft Spot's Tiny Tags Metal Dies and the Tiny Tags stamp set. I have used the Nesting Eyelet Squares for the card base. I cut the base layer also but used some fun pre~embossed silver paper I had in my stash. I then cut the sparkly corset at 4 3/4 from the Tie the Knot cartridge. I added a fun sheer black bow and some red tulle and the cute tag is My Craft Spot's Tiny Tags Metal Dies and the sentiment is from the Tiny Tags stamp set. I added a Twinery black twine bow and pretty red flower around the waist and some fun angel kiss skittles from my friend Carri at Double Click to finish dressing up the corset. I hope you like it! Hi Everyone! I have had a little time in my craft room the last few days and I have a project I would like to share with you. I made this for my daughter for a little surprise as last week she got a surprise bonus at her work for doing an outstanding job. We also wanted to show her how proud we are of her with just a little something. So, I made this fun gift box cutting it at 6 1/2" from the Sweet Tooth Boxes cartridge. The papers are from Bo Bunny that I had in my scrap stash. I added a fun polka dot bow along with a fun My Craft Spot tag using the Tiny Tags, Tiny Tags 2 stamp sets and the Tiny Tags Metal Die set. The Cappuccino Twinery Twine bow is also from My Craft Spot and the flowers are from Shabby Chic. I made a fun matching 3 x 3 card to go with the gift box with the scraps left over. 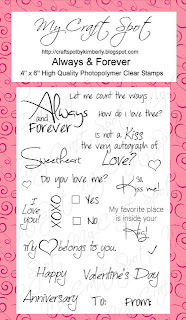 The sentiment is from My Craft Spot Inside & Out Set #1 stamp set. I am planning on putting a pretty necklace and a little cash for her to go treat her self to something fun. Good morning everyone. It was a rough day yesterday for all of us in my family.....we did end up having to put Gizzy down. He was the best dog ever and was a part of our lives for 16 plus years. We know he is in a better place.....he will be FOREVER missed!! Today is my DT post at My Craft Spot and I have a card to share with you today using My Craft Spot's Tiny Tags 2 stamp set and the Tiny Tags Metal Die set. I made this fun owl shaped card using my gypsy to weld the shape together. It is welded at 4.75 x 4.20 along with all the layers. I embossed the body of the owl with the sizzix love set and inked up the edges with frayed burlap. I hid the face features so I could stamp the adorable face using the PK-Winter Faces set and then used glossy accents over the eyes. I tied a fun double bow with Pink Petal Crinkle Ribbon and Divine Valentine Twist Twine and attached the fun little tag using the Tiny Tags Metal Die and the sentiment from the Tiny Tags 2 stamp set, all from My Craft Spot. I inked the tag with frayed burlap and topped it all off with a fun flower button that I found at Michael's last week.